Brampton Manor Academy aims to get students from disadvantaged backgrounds into higher education. Access to good tuition in a supportive environment can be all it takes to lift whole communities out of poverty and deprivation. Click here to stand up for quality education for all. In a country where seven of the last 10 prime ministers were Oxbridge educated, the UK’s top two universities are golden rungs up the career ladder. Research by social mobility charity the Sutton Trust released last month showed Oxford and Cambridge universities accept more students from just eight schools than from three-quarters of the rest of UK schools and colleges combined. One of the top eight schools, Eton College, sent 68 students to Oxbridge in 2015, from a year group of 267 students. But students at state school Brampton Manor Academy in Newham — the borough with the second-highest child poverty rate in London — have made headlines after 41 of them received offers from Oxford and Cambridge. 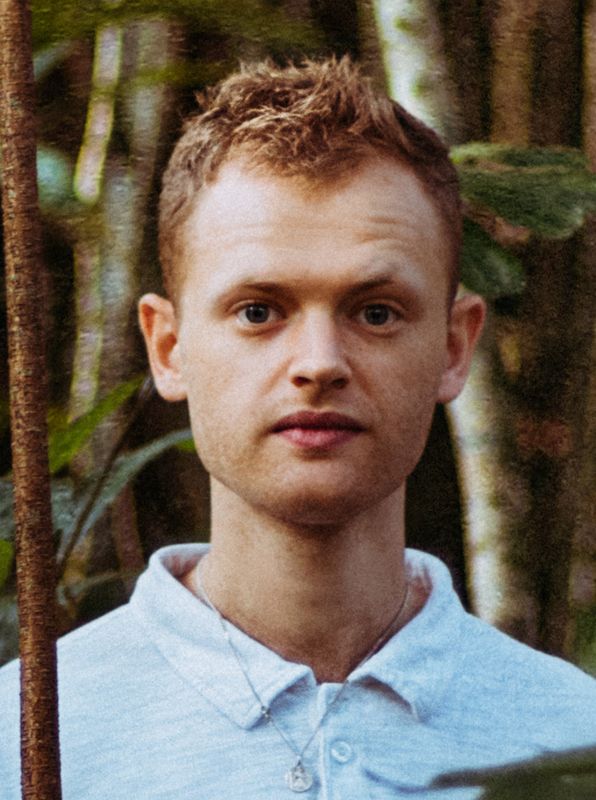 “We are passionate about instilling within our students the self-belief that they are good enough, that their talent and potential is far more important than any preconceived notion of the type of student Oxbridge might be looking for,” said director of sixth form, Sam Dobin, in a statement. “These young people have often overcome so much to get to this point and now have such exciting futures ahead of them; we couldn’t be prouder of them,” he added. The school opened its sixth form in 2012 with the aim of pushing more students from disadvantaged backgrounds towards Oxbridge and elite Russell Group universities. The first Oxbridge offer came in 2014, and numbers have increased until last year the school sent 20 students to the elite institutions — all 20 students were from ethnic minority backgrounds. Of this year’s 41 students who received an offer, two-thirds will be the first in their families to attend university and half receive free school meals. 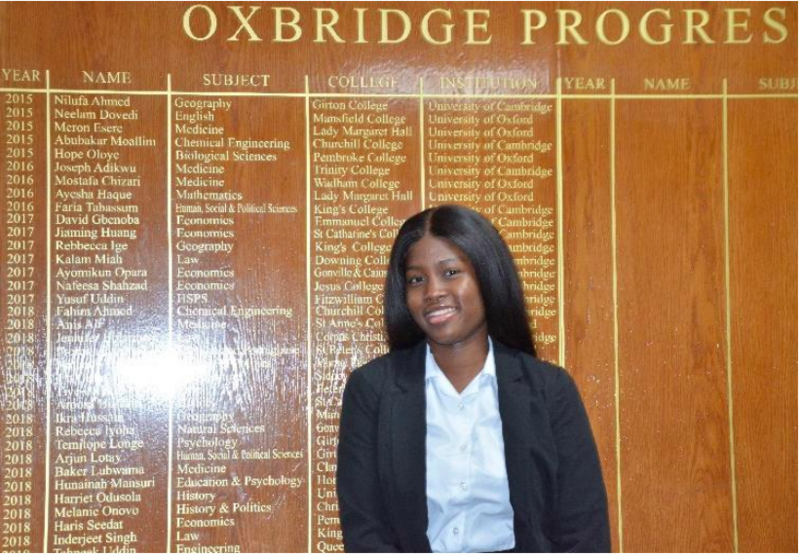 Dorcas Shodeinde, who has been in care since she was 14, now has an offer to study Law at St Catherine’s College, Oxford. According to the Department for Education, just 6% of former care leavers go on to higher education. “Brampton made me believe I was good enough to go to Oxford,” she added. In an interview with the Independent, Dobin said the school buys every student their own textbooks, there is a study centre open from 6 a.m. until 7:30 p.m. and there is an in-house team of five Oxbridge graduates solely dedicated to improving university access. “But the key is to keep telling your students that they're capable, that they're good enough,” he added. Lucy Dixon was recruited in 2017 as director of University Access, the Oxbridge-educated team supporting Brampton Manor students to reach higher education. “So many of these students undoubtedly have the potential to study at Oxbridge but just need the guidance and support, from course choice to confidence building, so that by the time they go to interview they feel like they belong,” she said. Baker Lubwama, 18, was one of 20 students from Brampton Manor College accepted into Oxbridge last year, and is now studying medicine at Clare College, Cambridge. He told Global Citizen that despite achieving academic success at his previous secondary school, his teachers discouraged him aiming at Oxbridge. "I saw on Twitter a few weeks before my GCSE results came out a boy called Joseph, he got four A* and was going to Cambridge to study medicine, and was coming from Brampton." "Joseph was a black boy like me, and I thought if he can do it, why don't I have a go as well?" Lubwama applied to get into Brampton Manor Academy and finished his A Levels at the school, before walking in Joseph's footsteps to study medicine at Cambridge. "One of the biggest things was being in an environment where I felt teachers believed I could do it, and knowing you are adequalely supported to do so," he said. Lubwama now says he shares his experience at Cambridge through his Instagram channel @millennialmedic, and has been contacted by current students whom he mentors and helps with their interview techniques. 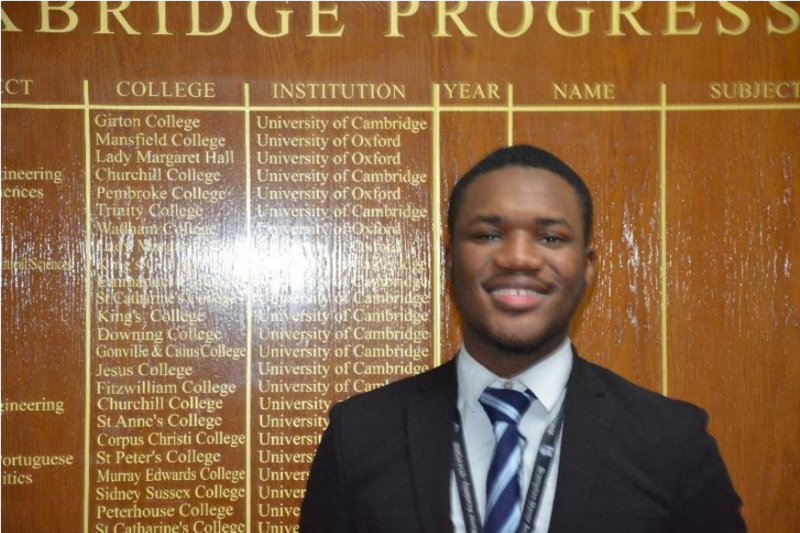 Meanwhile Victor Idowu, who is from a single parent family and receives free school meals, will be the first in his family to go to university should he take up his offer to study Medicine at Selwyn College, Cambridge. “This is something that I have wanted my whole life. It’s made my family really proud,” he said.